Finally this card saw it's true Glory with Mirage Caller combo to ban streamers for 3 days. Had a game where a rogue got this card from Swashburglar and it cast on my minion, so I played Auchenai Soulpriest to rekt him but it actually healed him. I tought all heals coming from my side of the board would turn into damage. Is that a bug or am I missing something? Just because it's from your CLASS doesn't mean the heals are coming from YOU. The original caster is counted as the "owner" of the heal. Since the rogue cast it, the rogue technically "owns" the heal, so it is unaffected by Auchenai Soulpriest. Helped in some heroics that start with the boss having a minion on the field. NPC isn't smart enough to realize its minion has 3 attack and is healing me for 4. This is a very versatile and well designed card. Against aggro, it can neutralize a minion for 1 mana, but not fully. The opponent still gets to use the minion to deal some damage to one of your minions. Healing four life a turn is as far as blizzard will let you go with one card. Forces an aggro deck to deal with whatever minion you put this on, assuming you are not dead on board. Synergizes with all the other "healing matters" cards, but not with the auchenai. This is good because the auchenai was very much a staple to most priest decks out there. 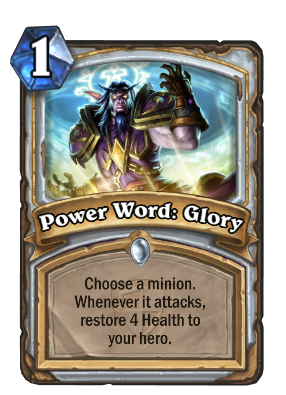 This adds to the priest's diversity. Also synergizes with the "build a massive minion" deck, in that this is another card to target your minion with, and the heal of 4 can offset the drawback of playing fewer minions than a regular deck. Builds on the 2 other aggressive shadow words in that it is imperfect removal, but with 4 life, you can offset the 4 power minion that your other words cannot hit. This is what I'm talking about. This card counters so much bull in the game that was outrageously broken, those dinky little huffers, leper gnomes, and Zap-O-Matics that are capable of dealing 6 damage to you in an early turn and tilting the game way more than an early minion should. Putting it on an enemy Zap-O-Matic also assures that with shadow madness down the road, you get an 8 heal turn as you steal the thing, kill a totem, and then ram it into something big. I actually think putting this on an enemy minion is the way to go far more than putting it on your own minion, as your own minion will probably be killed anyways, and on an enemy minion this can serve as a form of crowd control. Even if they trade it into a minion to kill it, 4 health for 1 mana is pretty good value, I'd say. So what happens the attacking minion (yours) is about to attack, he heals you, and your shadowboxer's ability triggers killing the minion the 1st one is supposed to hit? You get to try again? Yep. The same Shadowboxer interaction happens with Truesilver Champion. That's true, though I'm still pretty sure that priests would sooner have Blessing of Wisdom than this. Cards like Lesser Heal and Confuse push priest more towards a combo sort of archetype, but they don't have a whole lot of card draw to work with to consistently draw their combo pieces. I mean, they have Northshire Cleric, sure, but that doesn't actually allow for card draw all the time. in a world with face hunters, face pallys, tempo mages, mech mages. A world where you need to survive to enough mana to play any board clears you have. I bet most of the time this will be cast on an enemy minion to force it to trade itself or just not attack.